In the Learning Edition of VB there were only 4 ActiveX controls, but in the Professional Edition of VB, Microsoft has provided 20 additional controls. Some are very excellent and some you may never use. In this section of the tutorial I provide a few comments about each one, trying to give some useful pointers on the use of each control. I strongly suggest that you review my control summary chart - available in Excel 97 and Excel 5.0 formats. The chart gives the complete list of VB controls - along with their properties, methods, and events. The spreadsheet will help you get a "big-picture" overview of the VB controls (both Intrinsic and Pro). Equally strongly, I suggest you read the HELP file content for each of the properties/events/methods for these controls. If you don't know that the property or method of an object exists, then you won't know when to apply it in your applications! As with the Intrinsic controls, not all of the ActiveX controls are equally useful. Some you will use on many applications but you will use others only when you have a special need for the features the controls offer. When you start VB, none of the ActiveX controls are displayed in the Toolbox. Only the intrinsic controls are displayed, so you must manually insert the ActiveX controls into the Toolbox as you need them. To do so, right-mouse click on the toolbox and go to "Components", select the controls to put on the toolbox and press "OK". A little tip - in the startup box for VB you can select to open a project which contains every ActiveX control that VB installed. You might have missed it because that option is at the end of the list of project types that VB can open for you when you use the "File/New" menu. Here's a picture of the Toolbox with all of the Pro controls loaded. All of the ActiveX controls are contained within OCX files. None are built-in to VB. In some cases, Microsoft put more than one control into an OCX file. We'll give the file names later. Of course, everyone will have their opinion but since it's my tutorial I get to give my own opinion for the most popular Pro controls. These nine intrinsic controls are pretty much used on every VB application I've written. Start your learning with these and then branch out. Further down on this page I have a brief comment on each of the controls. Of the remaining ActiveX controls, I find some useful but mostly they sit un-used on my PC. It doesn't mean they don't perform their features well, it just means that my own applications don't find the need for the features very often. One of the things you'll notice is that I use a few controls a lot, and don't make a heavy effort to use every available control. I've thought about it a lot and wonder if VB programmers out there are like me, or if everyone uses their favorites over and over? You'll have to decide for yourself which approach makes sense. In the comments that follow I provide some of the logic which pulls me to one of these controls, or what it is that keeps me away! Personally, I don't do games and I find animation in business programs to be of marginal value (unless the animation is of real-time generated data). So, this is one of the controls I seldom use. Interestingly enough, I get a lot of questions from newbies on how to do animation and I steer them to this control. There really are some excellent reasons to become familiar with the MCI control. Programs like Laplink are hugely successful, primarily over their ability to work through the serial and parallel ports of a PC. I believe that 98% of all programmers never have that need. For the remaining two percent, however, this control can be a god-send. The concept is great - give your program a look and feel like that of other programs that your users are familiar with. 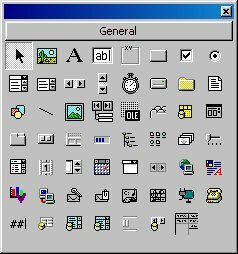 In practice, most of our users have been exposed to so many windows programs that an Explorer-like interface or a Win3.1 application interface are all so easily understood that unless your user is picking between your program and a second one, I don't believe the look-and-feel will buy you any more users. Take advantage of it if you want, or just use what you're familiar with. I tend to do things manually. Any control which automatically performs tasks for me tends to be ignored so long as I can get the job done with tools I'm already familiar with. This is a habit I really need to break. As I've said before, a programmer's job is to get the job done quickly and economically. Under those guidelines, controls such as the data repeater should be high on my list. I'll work on it! So far, I've never written a program which needed a calendar. I've done many where a date was entered but usually the date was the current date and that was easy to provide to the user. I can see where some programmers could put this to good use. The only thing that would entice me to use this is that it can be made to take on both horizontal and vertical orientations. That makes it pretty versatile. Otherwise, I'm not interested. This solves a problem which a lot of VB programmers have asked for, putting graphics in a list. It's more effort to program than a simple text list, but if you want the graphics then it's the way to go. I use the Toolbar control a lot! Since the Toolbar gets its images from this control, then that means I have to give this one a thumbs up! I need it, I like it, and I use it all the time. From what I've read, this is much improved over the version that came with VB5. Many of my users are corporate employees from engineering areas. Their needs rarely require an over-the-next solution so my experience on this one is minimal. However, since it is the only internet control in VB, then by definition you will use it if you have needs for Internet applications. The four controls - the listbox, the common dialog control, the TreeView and this one (ListView) can pretty well handle display of data in simple or heirarchical methods. It's a useful control, but not one that you cannot live without. This is an excellent example of a control which is very specialized, so much so that no one I know uses it. I have no doubt someone does, but I just haven't met them yet. You'd think that this control would be one of the most popular there was and that Microsoft would have made it an intrinsic control. But, it just didn't turn out that way. The earlier versions of the control gave it a very bad reputation and it doesn't seem to have recovered from it. It's not exactly the easiest to work with and the actual operation isn't as trouble-free as I'd like. I don't use it but I think about it a lot! Calendars in a program out to be very useful. Every PIM has one so why haven't my own applications had them? Maybe if I'd had this control in VB5 I'd be further along the learning curve. Yep - when I need a chart I use this one. Actually I don't like it all that much. It has a huge number of properties and I never seem to get all of them working together the way I want. Even so, it comes with VB and it can be made to do the job, so I use it. As I mentioned, I mostly do engineering-oriented applications. The use of .wav and .avi files would be fine, but for my needs I would want to create the .wav/.avi files myself and VB has no means of doing so. If you can use stock files from someone else, then this control is really a valuable tool. It's the only control in VB that does what it does, so it must also be the best one! Multimedia presentations and applications really are great. But as all artists know you can't just create a quality image in seconds. Having this control available to house images is fine, but where do all those images come from? Like with the Multimedia Control, this one is valuable to folks who have access to images that already exist and which meet their own business needs. This is the one where I am really delinquent. I owe it to my users to apply this control much more often than I do. I recommend that you use it whenever possible. The techniques of changing the cursor to an hourglass is good, but a progress bar is much better! This is very much a specialty control. For 99% of my user inputs, a simple text input is just fine. I've gotten a lot of email from users who are using this control so I know that the lure of better looking text must be hard to resist. However, I resist it and don't really have any reason to recommend this one to you unless you are writing some kind of word processor or if you really need to display formatted text. Yawn. Well, maybe not. There are times when adjusting something to get a value is needed. But I could do that with the intrinsic scrollbars already. This control is easier to use but I wish Microsoft had spent their money getting a totally new feature rather than a better old one. This one is an excellent way to give your user messages about the status of the application or about the status of a user request. I don't know exactly why I don't use it more, but I'm certain that my bad attitude will change. I recommend you learn how to use this one and that you apply it to virtually every program you write. Based on questions I get from users this one should be a big winner. There are all kinds of reasons why a programmer needs to know about the PC on which his .EXE is running. This control has made a good start in providing that kind of data to an application. I'd rather have seen it built in to VB as functions but until then you can use this control to get data that otherwise would require the use of the Windows API. The Common Dialog box is easily the most useful ActiveX control, and the Toolbar control takes second place. The control is reasonably easy to use and I've never had any trouble with it - it works as advertised! I highly recommend you learn to use this one. Except for the lack of a built-in ability to save its content, this control has a lot of application potential. I've used it or one of its predecessors in every version of VB since VB3. Learn to use it right and it can provide a very strong user interface for the display of ordered data. If you can't figure out how to save a tree structure, email me and I'll let you in on the code I came up with. Pretty simple, but actually pretty useful. It should have been intrinsic too, but it isn't. You won't have to spend much time on it to become an expert so just learn it and then put it on the shelf until you need it. You may not need it often but when you need what it does, you'll be pleased that it is available. I don't use it. However, lots of my visitor do ask questions about it and it seems to be a pretty popular control. As soon as I bite the bullet and get more into Internet programming I suspect this one will move up the list of favorites. As I said, I tend to use a few controls often and a lot of controls very seldom. If I was an expert in the controls I use infrequently, would I tend to use them more often? It's the old problem of not knowing what you don't know. I plan to work on stretching my control selection to give all of my less favorite controls a better chance. In a year, we'll see if my list of favorites has changed!